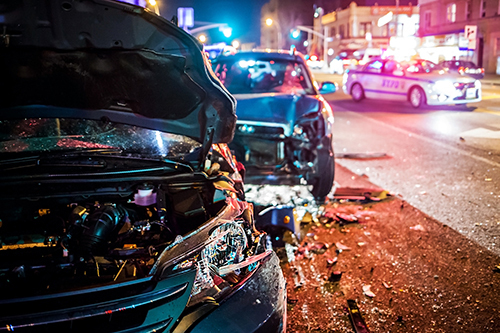 Car accidents, specifically rear end collisions, involve rapid acceleration and deceleration combined with large amounts of force being applied on the occupants of the cars involved resulting in car accident injury. This rapid acceleration of the head frontward and backward, or even side to side, from car accidents, is what causes car accident injury to the neck and spine. Putting the body under these forces can cause it to be strained, stretched and pushed in ways that it was not meant to be, and this is the cause of car accident injury. Whiplash is just one of many types of injuries that can occur in a car accident. Where whiplash is considered to be a minor injury and typical of a rear end collision, it can require chiropractic care to heal. There are also more severe car accident injuries such as spinal cord injuries that result in lifetime disabilities that require constant medical care and/or chiropractic treatment. If you have been injured in a car accident, or if you have been involved in an accident recently, and are experiencing discomfort, you should seek chiropractic attention immediately. All Injury Rehab and Chiropractic have five North Dallas / Plano area locations, each staffed by highly trained and skilled chiropractors who are skilled in the treatment of car accident injury. Visit one of our clinics today for a complete evaluation and digital diagnostic exam.